The operation known as "Market Garden" - made famous in the book and film A Bridge Too Far - was the largest airborne assault in history up to that time. A high-risk Allied invasion of enemy territory that has become a legend of World War II, it still invites criticism from historians. Now a thrilling and revelatory new book re-creates the operation as never before, revealing for the first time the full adventures of the bold "Jedburgh" paratroopers whose exploits were almost unimaginably risky and heroic. Kicked off on September 17, 1944, Market Garden was intended to secure crucial bridges in the Nazi-occupied Netherlands by a parachute assault conducted by three Allied airborne divisions. Capture of the bridges would allow a swift advance and crossing of the Rhine by British ground forces. Jedburgh teams - Allied Special Forces - were dropped into the Netherlands to train and use the Dutch resistance in support of the larger operation. Based on new firsthand testimony of survivors and declassified documents, Abundance of Valor concentrates on the three teams that operated farthest behind enemy lines, the nine men whose treacherous missions resulted in deaths, captures, and hair-breadth escapes. 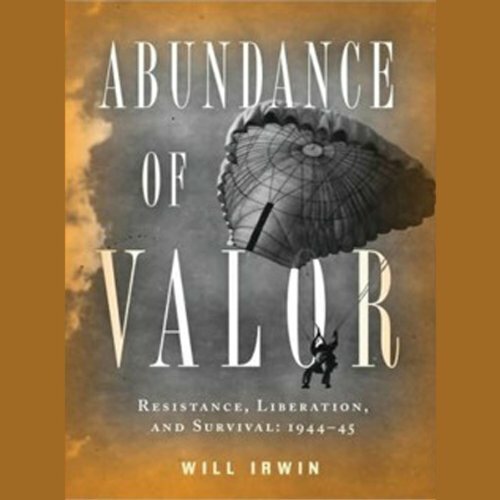 Abundance of Valor portrays with stunning verisimilitude the experiences of Lieutenant Harvey Allan Todd, who fought from a surrounded position against overwhelming numbers of the enemy before surviving capture, near starvation, interrogation, and solitary confinement in German POW camps, and Major John "Pappy" Olmsted, who made a hazardous journey, in disguise, from safe house to safe house through enemy territory until finally reaching friendly lines.